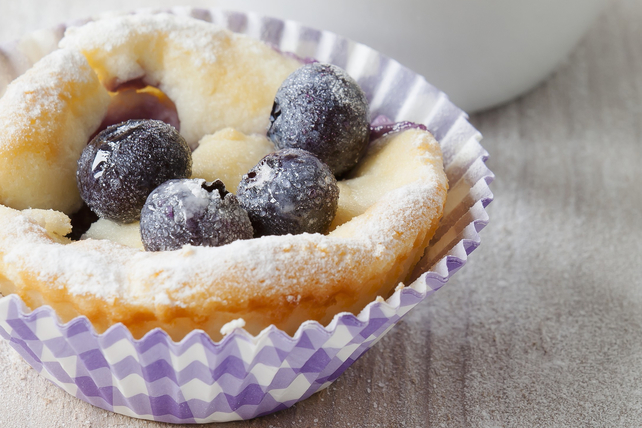 Studded with fresh blueberries and lemon zest, these delicious Blueberry Cheesecake Cups make the perfect recipe to serve as part of your next brunch brunch menu or to enjoy as a snack. Combine flour and baking soda. Beat cream cheese product in large bowl with mixer until creamy. Add sugar, ricotta and lemon zest; mix well. Gradually add flour mixture, mixing well after each addition. Add eggs, 1 at a time, mixing just until blended after each addition. Stir in blueberries. Spoon into 12 paper-lined muffin cups. Bake 13 to 15 min. or until toothpick inserted in centres comes out clean. Cool 5 min. Remove from pan to wire rack; cool slightly. Prepare using raspberries or blackberries. Sprinkle with icing sugar just before serving. Garnish with additional blueberries.